After booking your seats for one of the first two English services via NOAH, you are all set to visit The Star PAC! Just remember to have the QR code in your booking confirmation email ready, or bring along your registered access media, and breeze your way through the access gates to your reserved seats. If you need help while at The Star PAC, please approach our friendly ambassadors (in green T-shirts). You can also approach our general Information Counter and Rock Kidz Information Counter, both located within the Box Office on Level 3 of The Star PAC. Give yourself time to travel and arrive at The Star PAC, pass through the access gates and be seated inside The Star Theatre before service starts. The access gates will open one hour before service. Congregation members who have not entered The Star Theatre 15 minutes before service starts will be treated as “no show”. In such cases, your seats will be given up to congregation members in the walk-in queue. The Star PAC is located from Level 3 to 11. The directional signs at The Star PAC use door numbers as a point of reference. On Level 5, do take note of the door number assigned to your seat when deciding which escalator to take. Arriving Without A Seat Booking? If you would like to attend one of the first two English services on Sunday at The Star Performing Arts Centre (The Star PAC) but were unable to book seats, you can join our walk-in queue on Level 3 of The Star PAC. There are 1,000 seats available via the walk-in queue, on a first come, first served basis, unless specified otherwise. Have a prayer need? Let us pray with you at our Connect Points or Healing Room (at level 7). If you are looking for resources such as Pastor Joseph Prince’s books, CDs and DVDs, and music albums by our church, you may wish to check out NCC Resource (at level 5) or visit Rock Gifts & Book Centre at Level 2 (#02-07) of The Star Vista. If you are bringing children aged 12 and below, please note that when you attend our Sunday English service at The Star PAC, your children will need to attend classes at Rock Kidz, our children’s ministry. If you prefer to be seated with your children, please proceed directly to our service venue at Marina Bay Sands Ballrooms (MBS). Do arrive early at The Star PAC so you will have ample time to register your children and enter the theatre to enjoy the full service. If you have more than one child, do register your children with Mighty!, Beloved and Treasured first before heading to the Champions and Alive! area to avoid congestion. To facilitate easier access in and around The Star PAC, please avoid bringing strollers where possible. Please book them into their classes when you book your own seats by choosing either the “Rock Kidz Parent Seat Allocation” option or the “Main Congregation Seat Allocation” option. The two options offer different seat sections for you within the theatre. As your children’s class registration will take time, we encourage you to arrive 45 minutes before the 1st and 2nd services start, or 30 minutes before the 3rd and 4th services start, to register your children and be seated on time to enjoy the full service. If you are attending Encounter Night, please note that Rock Kidz will not be available at The Star PAC. We apologise that we are unable to accommodate parents who may wish to sit with their children in the theatre. Registration for Rock Kidz classes are at 7.45am, 10.45am, 2pm and 5pm. For a quicker and fuss-free registration, servers carrying mobile validators will be on hand to conduct health checks and log in your children’s attendance. If you are new to our church, please proceed to our Rock Kidz Information Counter at the Box Office on Level 3. Our volunteers will help to register your children. After serivce, please pick your child up personally and promptly. Youths from Fearless! (11-12 years) will be dismissed on their own. 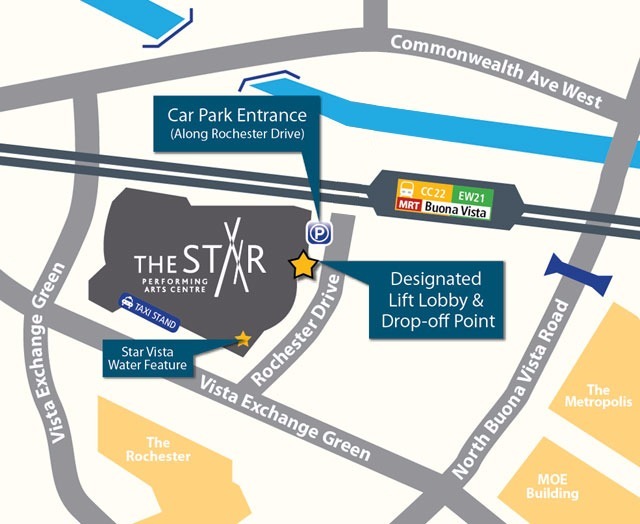 If you are taking private transport, you can choose to alight at the car porch in front of the designated lift lobby. Should you require any special assistance, please approach our ushers or you could also contact us at 6602 9205 (Tue–Fri, 9am–6pm) or via an online form.